Switzerland’s willingness to evolve with the needs of the blockchain industry was underlined in December last year, when the State Secretariat for International Financial Matters report detailed the country’s regulatory framework regarding cryptocurrencies and blockchain technology. The Federal Council’s report, Legal framework for distributed ledger technology (“DLT”) and blockchain in Switzerland, stated the opinion and intention of the executive body of the Swiss government. The report reiterates Swiss jurisdiction intentions when it comes to promoting a sustainable crypto and blockchain economy. Since the Bitcoin bubble burst in January 2018, the level of outright banning of cryptocurrencies and related technologies has significantly decreased. 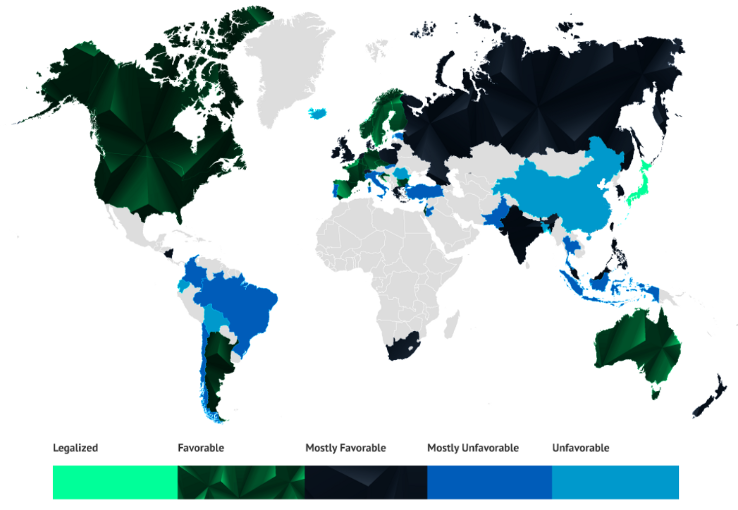 The landscape remains diverse among the countries, in terms of regulatory depth and timing as we alluded to in our previous article here. It is encouraging to see regional bodies beginning to take decisive action to put legislation into effect. In the US, the Securities and Exchange Commission (SEC) identified cryptocurrencies as a main focus this year for the SEC’s Office of Compliance Inspections and Examinations. Being a Swiss-based company, our attention has a clear focus toward Switzerland. It has hosted 15 percent of the world’s top 100 ICOs, and recent efforts represent significant steps towards consolidating its position as the premier crypto nation. In December 2018, along with the report on DLT regulation, the Swiss Federal Council, with the Swiss Financial Market Supervisory Authority (“FINMA”), implemented a Fintech licence, aiming to create an adequate, technology-neutral regulatory framework for any business that needs to accept deposits from the public without engaging in typical commercial banking activities. The latest report also stipulates Switzerland’s unique approach to regulation, distinguishing itself from competitive jurisdictions such as Malta and Lichtenstein. Switzerland will not take any steps to create a new law dedicated to blockchain. Instead, it intends to adjust specific legal framework with technical application of existing laws where necessary to support the development of the Swiss blockchain ecosystem. With this stance, it is our view that Switzerland considers the blockchain and crypto ecosystem an integral part of the broader development of its economy and not as a special sector in need of a dedicated legislative attention. In conclusion, the report shows Switzerland has taken a progressive stance compared to other jurisdictions relating to crypto business conditions while avoiding upending a generally harmonious legislative framework which has been perfected over a far greater time frame. The DLT report also takes a firm stance on key risks such as AML, counter-terrorist financing and blockchain-specific operational risks while giving expression to Swiss commitment to lead and align to the international effort and highlight the key AML-CFT challenges. The Swiss Canton of Zug is trying to establish itself as a hub for cryptocurrencies and Fintech start-ups. On January 1, 2018, the municipality of Chiasso, in the Swiss Canton of Ticino, started accepting Bitcoin as tax payments for amounts of up to CHF250. On February 16, 2018, FINMA published guidelines on the regulatory treatment of ICOs, which complement its earlier FINMA Guidance from September 2017. Currently, there is no ICO specific regulation, nor is there relevant case law or consistent legal doctrine. FINMA stated that due to the fact that each ICO is designed in a different way, it must be decided on a case-by-case basis whether and which financial regulations are applicable. In an ICO, investors receive blockchain-based coins or tokens in exchange for the funds they transfer. The tokens are created and stored either on a blockchain specifically created for the ICO or on a pre-existing blockchain. FINMA differentiates between payment tokens (cryptocurrencies), utility tokens, and asset tokens. Payment tokens (cryptocurrencies) are defined as tokens that are used as a means of payment or as a means of money or value transfer. Utility tokens are those that provide digital access to an application or service by means of a blockchain-based infrastructure. Asset tokens represent assets such as a debt or an equity claim against the issuer. FINMA does not treat payment tokens or utility tokens whose sole purpose is to confer digital access rights as securities. However, utility tokens that have an additional investment purpose or a sole investment purpose at the time of issue, as well as asset tokens that are standardized and suitable for mass standardized trading, are classified as securities. Funds raised in an ICO generally do not qualify as deposits within the meaning of the Banking Act. However, if there are liabilities with debt capital character, for example a promise to return capital with a guaranteed return, then such an ICO would require the organizer to obtain a banking license. When assets collected as part of the ICO are managed externally by third parties, the provisions of the Collective Investment Schemes Act apply. Provisions on combating money laundering and terrorist financing, which give rise to a range of due diligence requirements, apply to the ICO of a payment token (cryptocurrency) as soon as the tokens can be technically transferred on a blockchain infrastructure. In addition, the exchange of a cryptocurrency for fiat money or a different cryptocurrency as well as the offering of services to transfer tokens if the service provider maintains the private key (custody wallet provider) equally trigger the due diligence requirements according to the Anti-Money Laundering Act. In September 2017, FINMA closed down the unauthorized providers of the fake cryptocurrency “E-Coin”, liquidated the companies, and issued a general warning about fake cryptocurrencies to investors. Furthermore, three other companies were put on FINMA’s warning list due to suspicious activity and eleven investigations were conducted into other presumably unauthorized business models relating to such coins. In Switzerland, the individual cantons, the Swiss states, are obligated to levy income tax and wealth tax on the total property (assets and rights with a cash value) of taxpayers that are resident in their canton. Tax rates vary between the individual cantons. Cryptocurrencies are treated like foreign currencies for tax purposes and are subject to wealth tax. Holders of bitcoin or other cryptocurrencies are taxed at the rate determined by the tax authorities on December 31 of the fiscal year. As proof, the tax treatment CHFBTC exchange rate for bitcoin determined on December 31, 2017, by the Swiss Federal Tax Administration was CHF13,784.38 (or USDBTC14,514). This exchange rate is a formal recommendation for the cantonal tax authorities. Again, this highlights the treatment of cryptos as much a regulated asset as any other class and will form part of the wider capital structures that exist within the traditional frameworks moving forward.